The Apple Store App on iOS has been updated to version 5.0 and brings quite a handful of new additions to the table. The update holds several forward facing features and a new Sessions screen for finding the Apple Store. Apart from this, there are several improvements made to the in-store experience and much more. So let’s dive in to see some more details on the update. 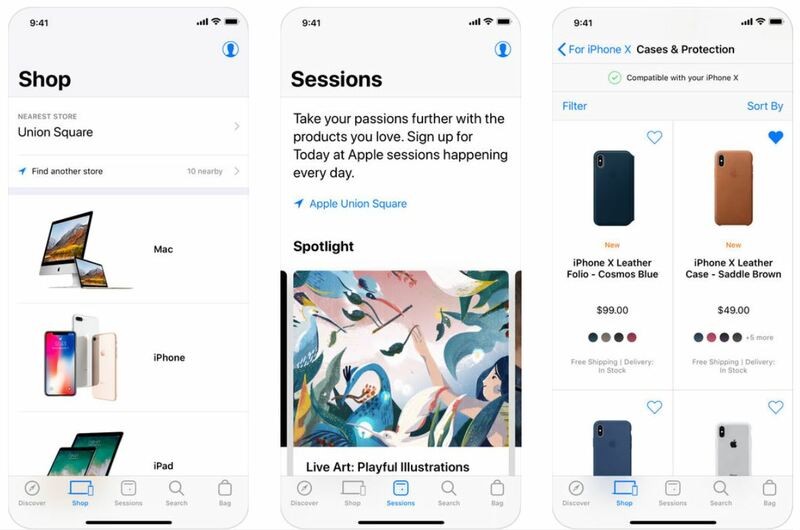 As per Apple, the update allows for a “more personal and relevant” in-store experience for shoppers. The app now offers recommendations on products and sessions and also shows their ‘Favorite’ products in stock. You still have the ability to skim and purchase accessories with the app. The new Sessions tab situated at the bottom of the interface features forthcoming events at your local Apple Store. The events could range from creative photography to filmmaking sessions and much more. The Sessions tab is oriented towards and compliments the company’s “Today at Apple” initiative. The Spotlight feed will present you with the upcoming events and more. Check out the full changelog. Unlock a more personal, relevant in-store experience. Get product and session recommendations, see Favorites in stock, and scan and buy accessories right from your iPhone. With the Sessions tab, find daily sessions on photography, music, and more to take your creativity further. You can also choose a session based on products you already own. Manage your orders in more ways. Now view invoices, edit shipping details and engraving messages, or cancel an individual item in your order. Get a better look at the savings that come with buying refurbished products. Discover design updates and improvements throughout the app. Tools for order management are also added. Now, you have the ability to view your invoices right from the app, shipping details can be edited and individual items can be canceled. Apple has also made it easier to check the price differences on refurbished products. All in all design updates and improvements have been made throughout the Apple Store app. This is all for now, folks. What are your thoughts on the Apple Store update? Has the overall experience been made easier for you? Let us know in the comments.